Recommended for Little League,High Schools, Colleges, and Professionals. Features heavy-gauge 1-1/2" tubular steel powder coated frame. Durable #42 heavy-duty weather treated polyethylene double sided pullover net. Measures 7'H x 7'W overall with a cutout that measures 39" up and 36" across. Assembles and stores in minutes. 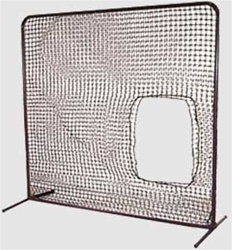 Works with live pitching and with softball pitching machines...those with softball legs. 7' x 7' (7 ft. Tall x 7 ft. Wide) with 3 ft.x 3 ft. cut-out. Worked as advertised. Fast shipping and good price. thanks. Heavy duty frame, works great, would definately recommend.